Camellia is blooming now. In Japan, there are two kinds of camellia –sazanka 山茶花 and Tsubaki 椿。They look quite similar, so it’s hard to distinguish. They are both used for flower arrangements 茶花 at the traditional tea ceremony. Rikyu 利休, who perfected the Japnaese tea ceremony in the 16th century, said the flower arrangements at the ceremonies should look natural, as if they are in the nature. The tea ceremony is not just about matcha tea, but is also about ikebana 生け花, shodo 書道(Japanese calligraphy), pottery and so on. The tea master emphasized simplicity in every aspect of the tea ceremony. Japanese people never choose camellia flowers as souvenirs when they visit to a sick person. The reason is that camellia flowers (especially Tsubaki cultivar) tend to drop off abruptly rather than the petals falling one by one. It looks as if heads are falling off and people find it ominous. Did you know that the tea plant is the same species as the camellias? 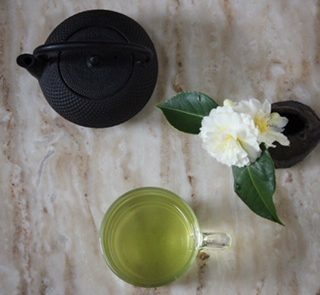 The tea plant ’s binominal name is camellia sinensis. All the teas—black tea, green tea, white tea, matcha—are made from this plant. The difference in the end products come from how they are processed. Enjoy teas while camellias are in full bloom!